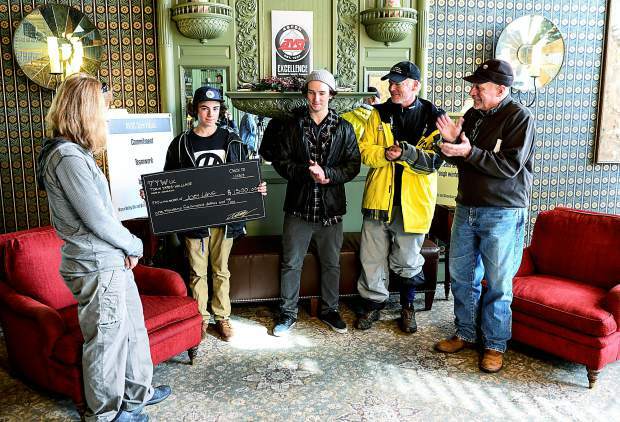 Aspen Valley Ski and Snowboard Club freestyle skier Joey Lang, 15, accepts a $1,500 annual scholarship from 17-year old AVSC athlete Torin Yater-Wallace. Wallace is funding the scholarship in recognition of athletes who are most deserving in the sport. Pictured from left to right are Stace Yater-Wallace, Lang, Torin Yater-Wallace, AVSC freetyle director Eric Knight, and AVSC director of excellence Walt Evans.